Figuring out the division of labor at home is never easy. From those very first days when we nervously bring our fresh little human home, there are seemingly infinite decisions to make about who does what, when, and how often. We partnered with our friends at Bumkins to interview three full-time working #MINDRMAMAs about how duties are shared in their household. 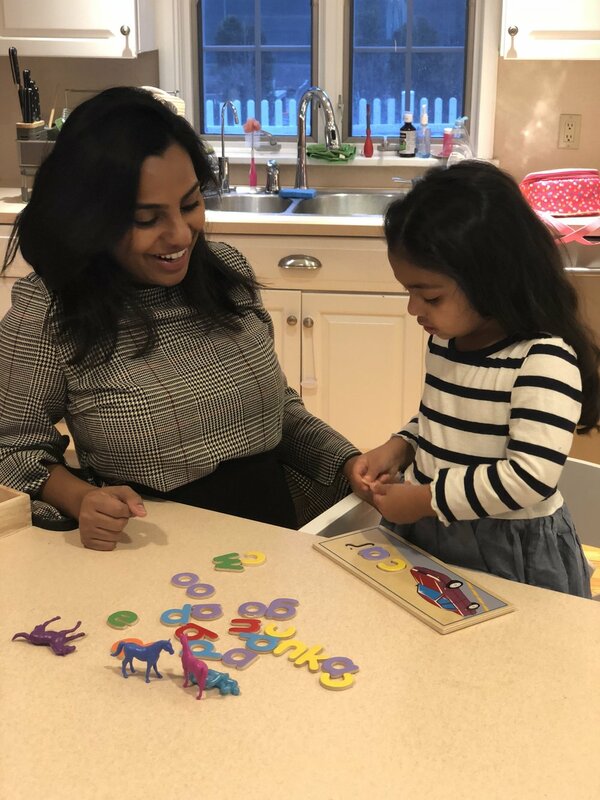 Up third in the series is intellectual property lawyer Rachel Santori, who shares her family’s unique approach to the home-life juggle. I work full time as an intellectual property attorney. It’s a very busy career but thankfully I love my job and my firm is amazing! The leadership is sensitive to the needs of working parents. I work from home on Mondays and Fridays. Tuesday – Thursday, I go into the office and, on those days, I have an evening nanny who comes in at 5:30pm when my regular nanny’s day ends. I’ve accepted that, if I go into the office, I am not making it home for bedtime. I found constantly trying to coordinate who will make it home on those days to be too stressful. Having regular evening help allows me to plan to stay late, plan my dinners and events for those nights, or just use that time to go get a manicure! My husband travels a lot and works very long hours, and is also passionate about his work. Every few days we look ahead and figure out who can do what. If you look at just the division of labor of childcare, it’s probably uneven and I do more of the work. But we don’t think about it that way and, instead, we divide up all of the “labors” of life. My husband fully takes on a lot of chores and responsibilities in other areas to balance the load. In my opinion, I get to do the fun stuff while he’s stuck with taking care of taxes and trash! Our division is also changing as our daughter grows. In the early days when she was breastfeeding, there was less that my husband could do to contribute. Now that our daughter is walking and talking, it’s all hands on deck and it’s easier for my hubby to pitch in. I thought a lot about it, did a ton of internet research and read several books on this topic. But, in the end, we just had to work out this new dynamic and keep trying new things until everyone felt comfortable. In the beginning, I thought I had “ruined” everything by taking on too much and set a bad precedent of doing everything. I’ve since heard several other moms tell me they thought they did this too. Moms – it’s ok! Once your kid gets older, I think it’s easier for dads to bond with them and they will want to hang out with them and take care of them. One thing that I have come to realize is that this is always a process and we are always improving and figuring things out. I think for me the challenge is to let go and let my husband and others help me more often. I love automating as much as possible in our lives. I have Amazon subscriptions for all of our basic necessities, and all of our bills get auto paid. Packing lists have really changed traveling for me – it’s so much less work to follow a packing list rather than to mentally go through everything the baby will need each time we’re going away for a night. What’s your family’s approach to balancing the workload at home? Tell us in the comments. And check out Parts I and II of this series with Bumkins here and here.